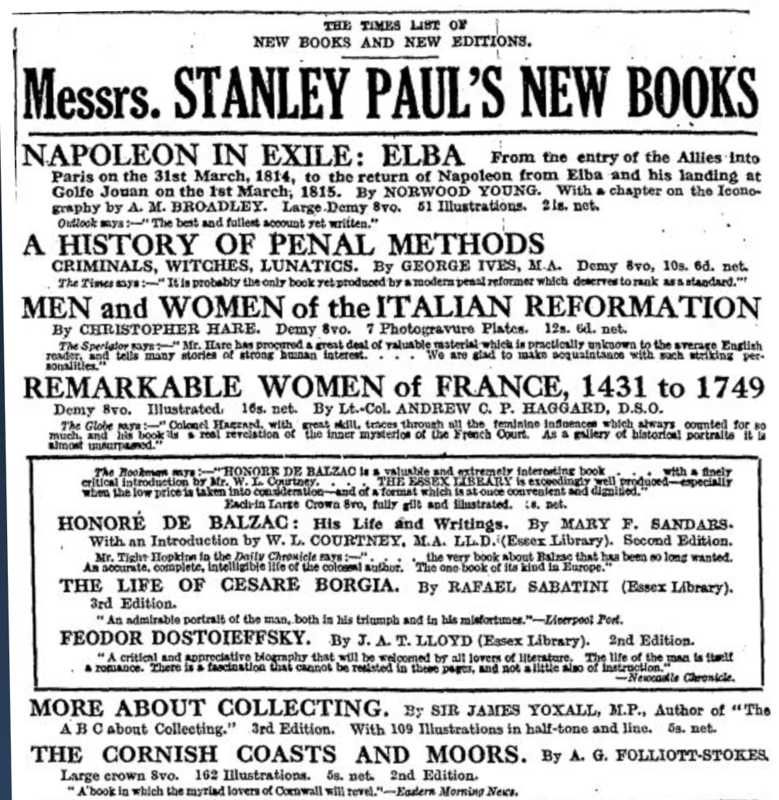 The Bookseller (November 14, 1913) indicated that Stanley Paul’s Essex Library series would be published “next week.” The idea was a series of reprints (mostly revised editions of titles published in the previous decade or two), including biography, literature, history, and the arts and sciences. Some titles were Stanley Paul back catalog, other’s were acquired from the original publisher. The series was named after Essex Street, Stanley Paul’s office address in London. The series did not amount to much, with five titles published between 1913 and 1917. 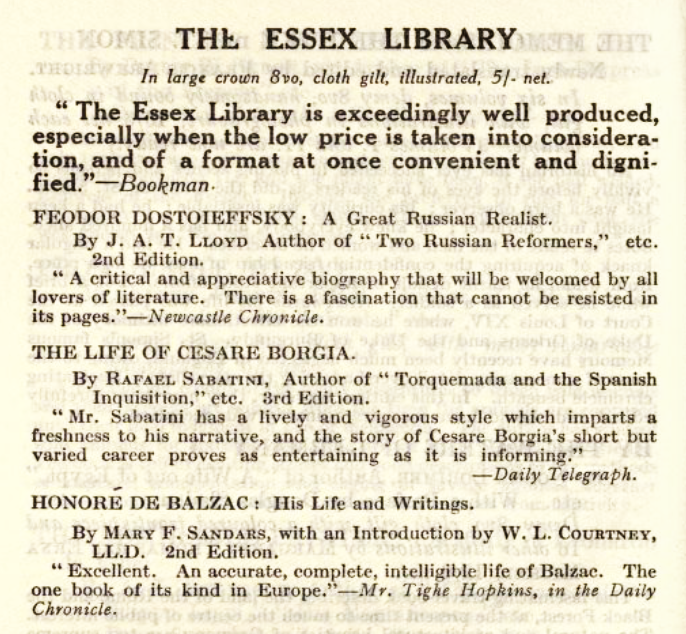 Benn reused the Essex Library (Benn’s Essex Library) name in a reprint series they initiated in 1931. Stanley Paul’s Essex Library series is a bit of a mess. The series name on the back of the dust jackets is misspelled (above): “Esser” rather than “Essex.” The first three titles are given different serial numbers in different sources (#1 and #3 are interchanged). There is no serial number on or in the books, making it difficult to assess which serial number is associated with which book. After the third book, the titles don’t include series numbers. Many of the titles are undated, or use original copyright and not printing dates, and don’t include the series name in the book at all, thus inclusion in the series and dates of publication for the titles are unclear. Catalogs (in the back of Stanley Paul titles) sometimes include books in the Essex Library listing that are not actually in the series. As said, a mess. 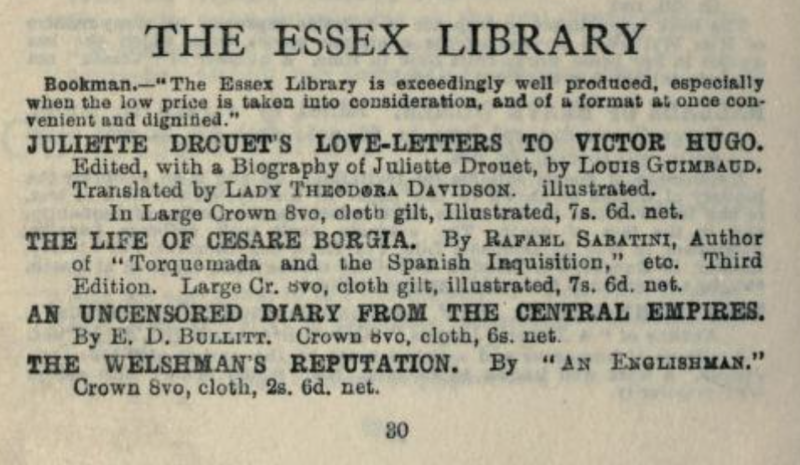 Obviously, not much effort was put into the poor Essex Library. 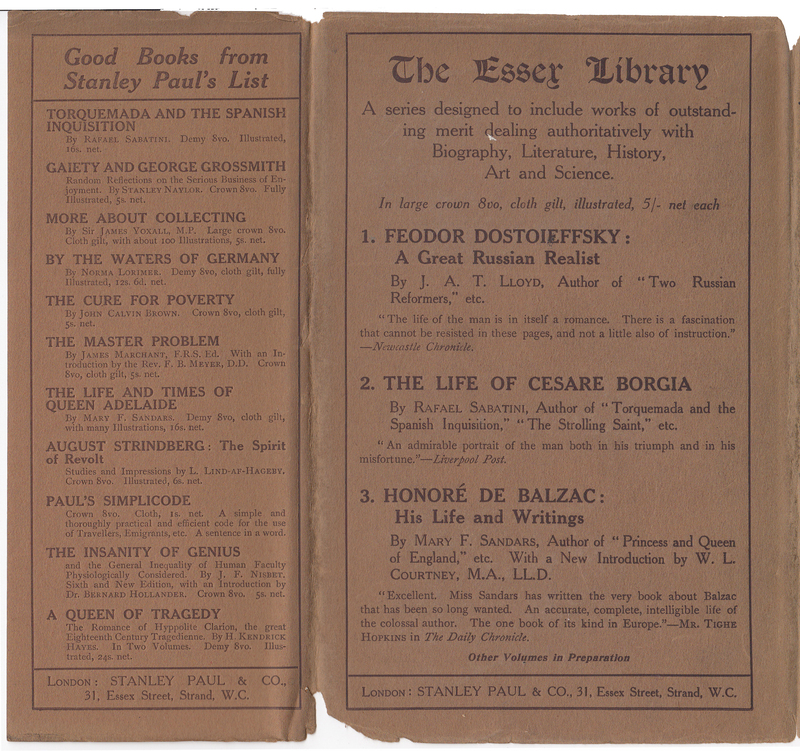 The initial three titles were advertised, with brief reviews, in the back of a copy of Cakes and Ale, by Edward Spencer (Stanley Paul, 1913). 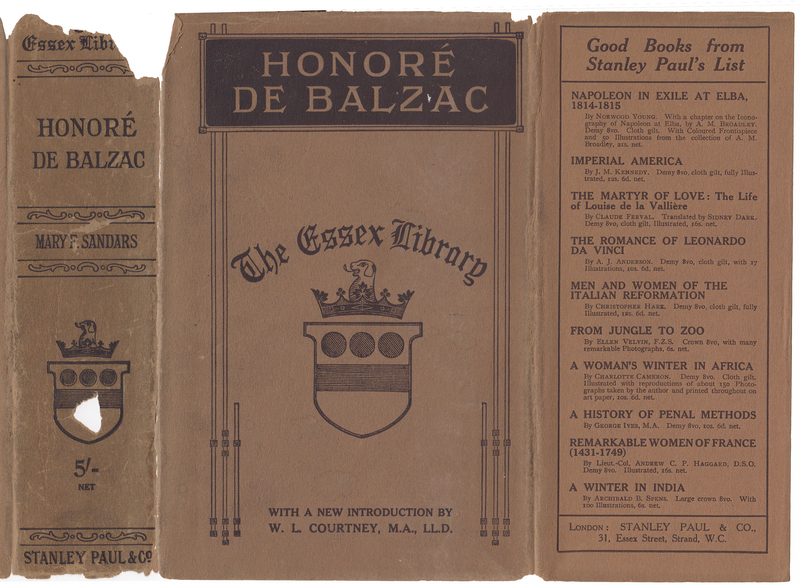 These three titles were issued in 1913 and 1914. The series numbers appear, variously, on the first three but not the final two titles in the series. 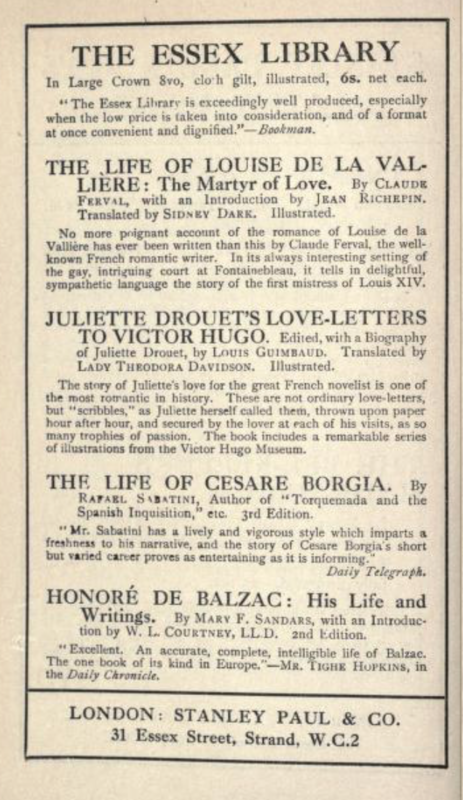 Two more titles were added to the series, in 1914 and 1917, and listed in an advertisement in the back of a Lotus Library series book, Romance of a Harem, published by Greening & Brentano’s, in 1917. 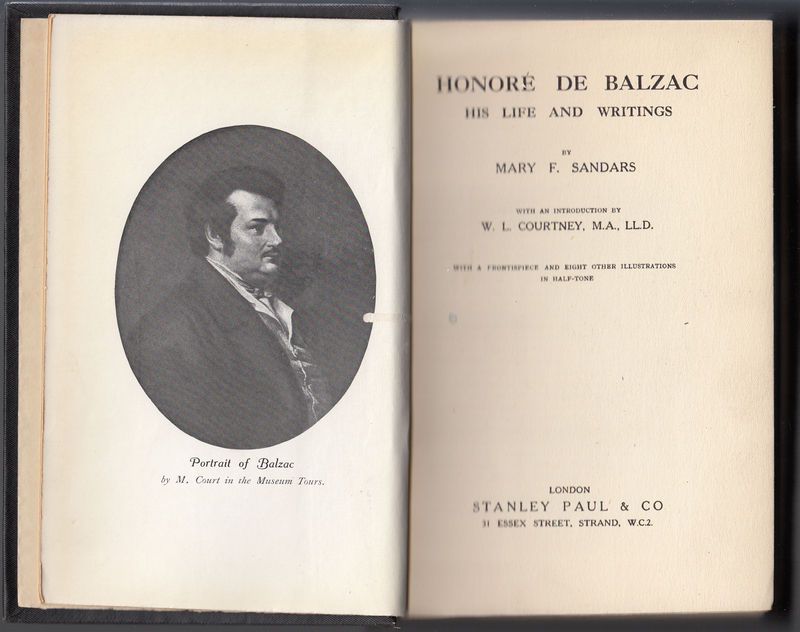 A book published by Stanley Paul in 1922 includes two of the first five titles (Juliette Drouet’s Love-Letters, Life of Cesare Borgia) and, seemingly, two additional titles. I am pretty sure these two titles (the last two below) were not actually in the series. Instead, the catalog was set up rather oddly. I believe there were only two titles, in 1922, still available, in the series. Advertisement from Green Room Gossip by Archibald Haddon (Stanley Paul, 1922). 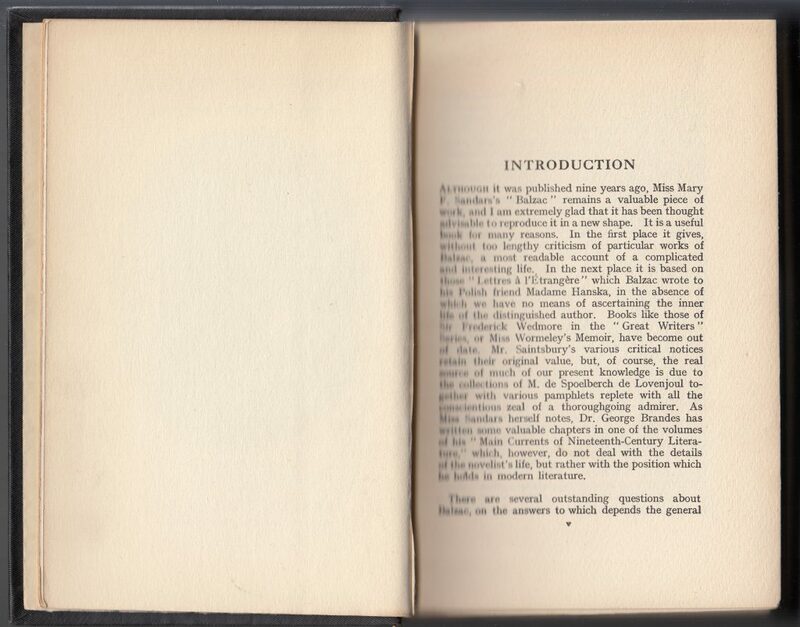 Dust jackets for the series are probably common in design, formal and a bit overwrought. This copy of a biography, Honore de Balzac by Mary Sandars was published as part of the series (either #3 or #1) in 1914, revised from an edition published in 1904 by Murray. This is a big block of a book: the jacket spine has plenty of room for the series name, title, author, series colophon, price (5/- net) and publisher. The jacket front includes the title, series name, and an indication of a new introduction by W.L. Courtney, but no indication of the author (this tendency is not uncommon with jackets in the early part of the 1900s). The front jacket flap lists 10 recent Stanley Paul publications. The rear of the jacket, with the typo in the series name, blurbs the series and lists the first three titles in the series, each with an excerpt from a review (most likely of the initial editions of these books). The rear jacket flap lists an additional 11 Stanley Paul publications. The bindings are in black cloth with gold typography and decorations. The binding does not include the series name. This suggests that the series name was somehow important in selling the book (the customer would see the name on the jacket) but once the jacket was removed, the book, without the series name, was possibly perceived as looking a bit more expensive and classy at home on the bookshelf. The book title and colophon are debossed on the front of the book. Designs from the jacket are mimicked on the book itself, common on late 19th and early 20th-century publisher’s series books. 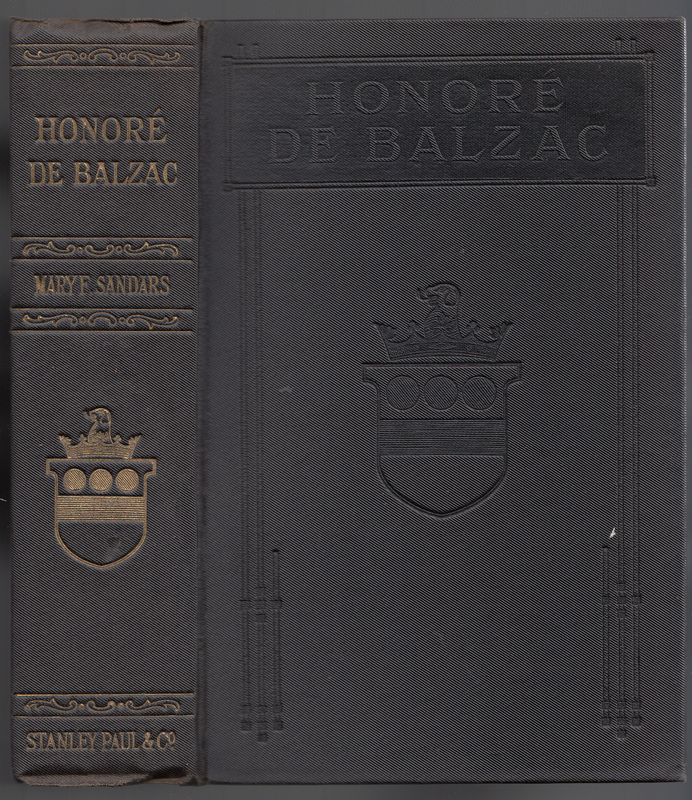 A portrait of Balzac faces the title page. The title page indicates the new introduction and illustrations. 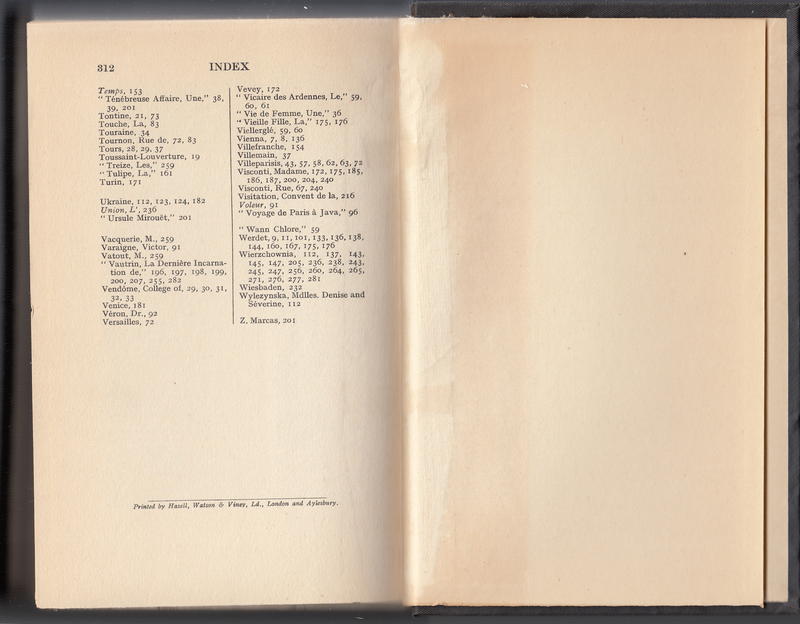 There is no date on or in the book, and the copyright page is blank. This is a bit odd, as this was a revised edition with a new introduction. The last page in the book lists Hazell, Watson and Viney Ld., London and Aylesbury as the printer.